Visitors to Las Vegas often never realize that the glittering lights of the Strip are surrounded by vast expanses of uninhabited terrain and mountains, a lot of mountains. In fact, in mountainous terrain per square mile, Nevada is by some accounts the most mountainous state in the union. Don’t be deceived by the desert either. It teems with plant and animal life. Even a short city hike along the Upper or Lower Vegas Wash gives you a view of the region’s abundant natural beauty. Desert willows, creosote, mesquite, sage, jimson, desert pumpkins and a variety of cactus demonstrate their adaptability at surviving in the harsh climate. Coyotes, rabbits, burrowing desert owls, many species of reptiles migratory birds and the ubiquitous hare known as the jackrabbit scurry across your path as you walk. Depending on where you are you might even run across a bighorn sheep. 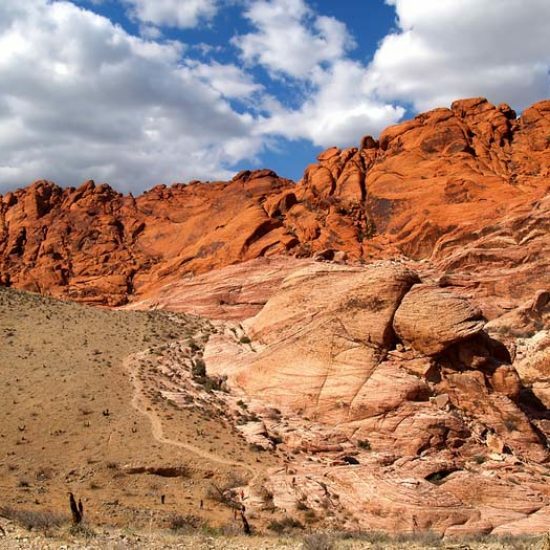 In short, there’s a lot to see once you move away from The Strip and easy access to the backcountry and mountains around Las Vegas offers up some exceptional hiking for the occasional and experienced trekker. Here are just a few every hiker should check out during their stay in the Mojave Desert’s City of Lights. Located about 20 minutes from the Strip, this national conservation area boasts more than twenty separate hiking trails of varying length and intensity. A good starting point is the short, easy 0.2 mile walk out to the Petroglyph Wall, an ideal hike for families with young children. The 800-year-old Native American drawings on the rock wall fascinate and give a sense of the antiquity of the area. Calico Hills offers a trail of moderate intensity that varies in length from two to six miles, depending on where you access it. Hikers who make the entire journey are rewarded with spectacular views of the vermilion sandstone cliffs. Enjoy views back to the Las Vegas skyline too! Icebox canyon is a moderate hike culminating in a seasonal waterfall and pool. This trail is very popular in February through April with snowmelt making the waterfall a must see sight. Get a taste of real desert backcountry on the La Madre Spring Trail. The scenery changes from red to white cliffs as you follow an old canyon road on the 3.5-mile moderate hike through juniper, pinyon pine and scrub oak. At the end, the spring provides a stunning contrast to the surrounding desert. There’s plenty more in Red Rock Canyon. Hike one trail and chances are you’ll be back again. An hour north of Las Vegas, Valley of Fire State Park is another desert beauty with an assortment of hiking trails. The trails are fairly short, 0.5 to 1.5 miles, easy to moderate in intensity and perfect for a day’s excursion into the surrounding desert that remains hidden from most Las Vegas visitors. It’s possible to experience all of the half-dozen trails in a day if you’re up for the walk. Taking its name from the surrounding flame red sandstone cliffs, Valley of Fire is alive with natural beauty and ancient relics. Hiking trails take you past Native American petroglyphs, through narrow-walled rock canyons and down to natural rock tanks that fill with water after rain, a feature that attracted ancient Native Americans and which still brings in wildlife to this day. This alpine refuge is perhaps one of the most surprising backcountry adventures you can have while visiting the Las Vegas area. Climbing out of the desert valley, the elevation quickly rises above 7,000 feet, even higher depending on how far and high you want to hike. With a dozen or so separate hiking trails, hikers at all levels can enjoy the cool mountain air and stunning views. For those with mobility issues or small children, the 0.1 mile Desert Overview walk along Highway 158 offers amazing views of the Mojave Desert floor thousands of feet below. Cathedral Rock offers a more intense 2.8-mile hike that climbs almost a thousand feet along switchbacks through forests of ponderosa pines and aspen. At the top, hikers are rewarded with a stunning view of Kyle Canyon from their perch at 8,000 feet above sea level. Winter snows close the trail from November through April, so make the most of your opportunity if you get a chance to visit. Another Mount Charleston hiking gem is the Upper Bristlecone Trail Accessible near the ski lodge at the top of Lee Canyon. If you make the loop that includes a portion of Highway 156, the entire hike is a little over six miles. The shorter out and back walk is 4.6 miles. The trail is rated moderate to difficult, primarily because of the elevation. Beginning at around the 8,500-foot mark, the trail gains another 850 feet as it wanders through forests and over mountain ridges. Spectacular Alpine views and cool air will make you forget that you are only an hour from the Vegas Strip. Take a break from the norms of everyday life and experience the delight of hiking Nevada’s backcountry and mountain trails. You’ll find an unexpected jackpot of natural beauty. For more information on our area, please contact us at Team Kuptz! We’d be happy to share our love for our area.